When puppies have to go, they have to go. And that usually means as soon as they wake up, a few minutes after every meal, and at regular intervals in between. Your puppy’s only concern is to do it away from where they eat and sleep – they don’t instinctively know that you’d prefer they went outside. If you can dedicate yourself to the task with non-stop vigilance and lots of patience, you can house train your puppy in just three weeks. Start the moment you get home together. 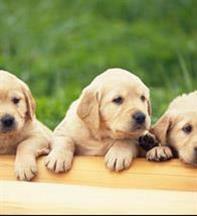 With their lead on, put your puppy on some newspaper or a puppy mat at the spot in the garden you’d like them to use. Tell your puppy what to do, with a command like “toilet”, wait, (and wait and wait) until they go, then praise them thoroughly and offer a tasty treat. After a week or two, they’ll get the idea and give a bark or two to warn you – ignore this at your peril. Just make sure you’re extra patient. Accidents will happen, so keep a generous supply of newspapers or puppy mats spread around the house and clean up quickly – any lingering smells will encourage repeat behaviour. You’ll soon figure out how often your puppy needs to go outside – depending on size, it could be every two hours, every hour or every half hour. And if they sometimes seem to do nothing but circle and sniff, you’ll have to keep on taking them outside until they’re properly toilet trained. It can be frustrating, but it’s worth it in the end!